Mass Effect: New Earth debuted May 18 at the Great America theme park in Santa Clara, CA. People who have photosensitive epilepsy probably are already cautious about going to amusement parks, since lots of rides and other attractions feature fast-moving lights and flashing images. Now there’s another reason they should be wary: video game-based attractions are coming to amusement parks, and some of those games have seizure-inducing images. “The game manufacturers and game designers want to have a place to show their games at a scale that you can’t do in your house,” according to the CEO of Cedar Fair Entertainment Company, which owns 11 amusement parks. 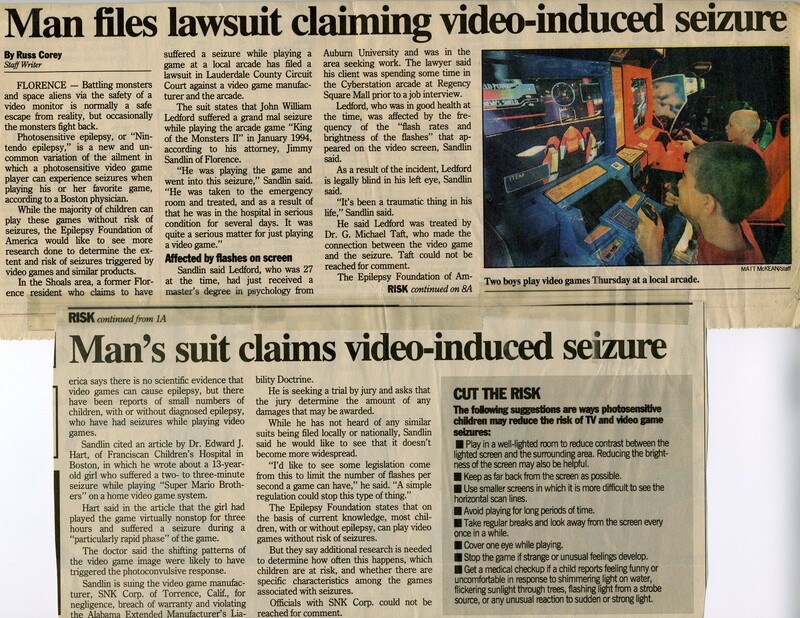 To put it another way, they’re blowing up the visuals of an action video game with seizure risks, and displaying those images on a huge screen! Here’s the problem with that: Images on an oversized screen have a greater impact on the brain’s visual cortex than the same images viewed smaller. This means that even if a person with some degree of visual sensitivity plays Mass Effect on an Xbox, without incident, that person would be more likely to experience a seizure at the theme park attraction. An attraction based on BioWare’s Mass Effect opened last month at California’s Great America theme park—on a 60-foot LED screen. Curious about whether the at-home games contain potentially seizure-provoking images, I tested** the images in promotional trailers for Mass Effect 3 and Mass Effect 4. I found violations of seizure reduction guidelines in both. A 15-second commercial for Mass Effect: New Earth also fails the test for compliance with the guidelines. At North Carolina’s Carowinds amusement park, “the world’s first intra-active 3-D game experience” Plants vs. Zombies Garden Warfare: 3Z Arena opened in March. It’s shown on screens measuring 14.4 x 26 feet. The attraction is based on the Plants vs. Zombies franchise. In my tests, some clips from the Plants vs. Zombies Garden Warfare game violate seizure reduction guidelines. I didn’t have video I could test of the park’s big-screen experience. When designing an attraction based on a game with seizure-provoking images, shouldn’t the theme park industry be especially mindful of patrons with photosensitive epilepsy? Warnings at the park about rides that could be hazardous to patrons with certain medical conditions such as pregnancy, heart conditions, or epilepsy aren’t enough. Many people don’t even know about their vulnerability to seizures from certain visual effects until they have an unmistakable seizure. Not all seizures are easily noticeable! And even small seizures that aren’t seen can leave impairing after-effects. Video game-based attractions at amusement parks are expected to multiply. Universal Studios and Nintendo signed a deal last year to bring Nintendo-based attractions to Universal’s theme parks. The first of these, slated for 2020 completion, will be a whole section of Nintendo-based attractions at an existing theme park in Osaka, Japan. Industry observers suspect that Universal’s recent land purchase in Orlando is intended for a Nintendo-based expansion of its Universal Orlando theme park. Ubisoft has announced an entire “next generation theme park” scheduled to open in 2020 in Kuala Lampur, Malaysia, with rides and attractions based on its portfolio of game franchises. You can read about seizure reduction guidelines here–they were developed in the UK to reduce the risk of seizures induced by TV. All material broadcast on UK television must comply with the guidelines. To test images for the likelihood of provoking photosensitive seizures, I run downloaded video clips through an application called the Harding Flash and Pattern Analyzer. (Graham Harding is one of the world’s leading experts on photosensitive epilepsy.) The FPA is widely used by producers and networks in the UK—including by the BBC—to reduce the risk of seizures from material on broadcast TV.